Daniel P. Kelleher, 74, Massachusetts Hockey Hall of Fame Member, passed away on May 29, 2018. Massachusetts Hockey was incredibly honored to have Coach Kelleher in our District volunteering. In 2001 he was the recipient of the William Thayer Tutt Award, USA Hockey’s highest volunteer award. 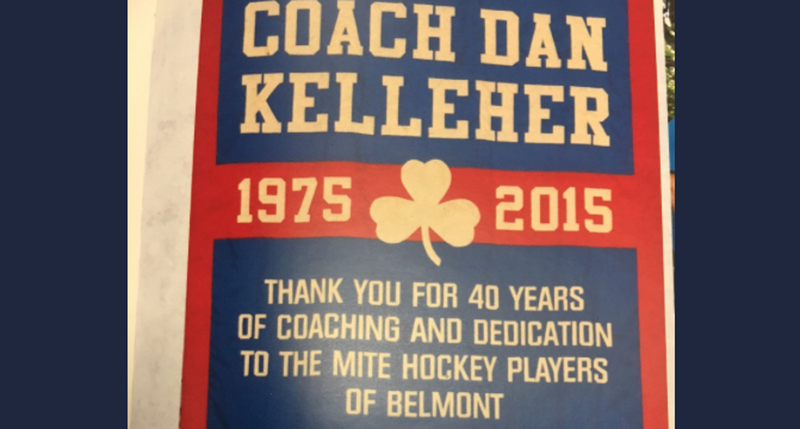 For 40 years he was a dedicated coach for Belmont Youth Hockey. Also, he dedicated 20 years as a coach for the Junior Varsity Boys Hockey team at Belmont High School. Daniel was a longtime self employed plumber, who dedicated his spring season as a coach for 35 years to Belmont Little League and for 30 years to Belmont Senior Babe Ruth Baseball. Relatives and friends are respectfully invited to attend Visiting Hours in St. Joseph Church, 130 Common St. Belmont on Thursday, May 31, 2018 from 3-8 P.M.
A Funeral Mass will be celebrated in St. Joseph Church on Friday, June 1, 2018 at 9 A.M. Interment Belmont Cemetery. In lieu of flowers contributions in his memory to the Daniel P. Kelleher Scholarship Fund, c/o BYHA P.O. Box 154 Belmont, MA 02478 or to the Brendan Grant Scholarship Fund, P.O. Box 184 Belmont, MA 02478 would be appreciated. Daniel P. Kelleher's Obituary posted online at Stanton Funeral Home. aniel P. Kelleher's Obituary posted online at Legacy.com.